As climate change creates stronger, potentially more frequent storms, building campaigns that respond to disasters and empower victims is crucial to meeting both climate and justice goals. The Philippines, a country vulnerable to natural disasters and climate change, is on the front lines of crisis response. There, the climate threat and the need to build resiliency became harsh reality in 2013, when one of the strongest tropical storms in recorded history formed in the Pacific and hit the Philippines. Super Typhoon Haiyan – whose massive size and strength many scientists clearly connected to climate change – washed away entire villages, destroyed infrastructure, and left thousands homeless. 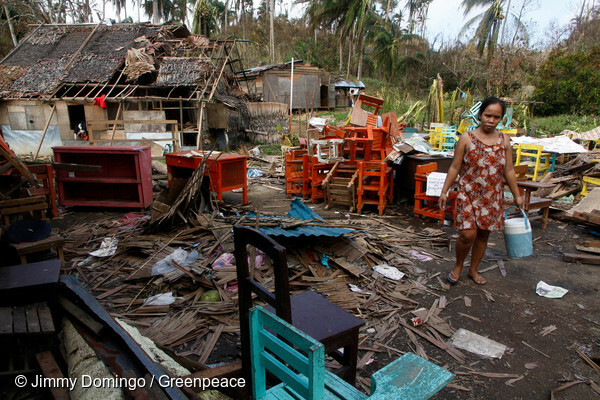 Haiyan impacted the entire Philippines economy, and was a watershed moment for the country. Greenpeace Philippines, like many organisations in the country, was not ready. Despite the link between Haiyan’s devastating impact and Greenpeace’s programmatic work in energy, climate justice, and ecological agriculture, the response was far less than it could have been. Houses in the town of Dolores, in Eastern Samar, Philippines, were destroyed by Typhoon Ruby (Hagupit) in December, 2014, just 13 months after Typhoon Haiyan devastated the same area. Eighty percent of the more than 800 homes in Dolores were destroyed. Photo © Jimmy Domingo / Greenpeace.Greenpeace is bearing witness to the impacts of the typhoon and calling for polluters to be held legally and morally accountable for climate change damages. This is the new reality that climate scientists have warned us about – that as long as global greenhouse emissions rose, a disaster and climate vulnerable country like the Philippines was inevitably going to be hit by strong typhoons and other climate-related weather events. Greenpeace seeks to be more proactive for its sake as a local, respected, Philippines NGO. Working with impacted communities demonstrates how Greenpeace’s goals may empower people to withstand climate impacts. Together with the Greenpeace Response Lab, the Philippines office made a plan to prepare and respond to future extreme weather disasters. According to Obusan, the key was understanding Greenpeace’s resources, and building a communications framework. The plan had been developed for potential extreme weather impacts connected to El Nino, but as Typhoon Ruby readied to hit the Philippines in late November 2014, the plan was adaptable. Unlike the previous year, local Greenpeace staff were ready. Greenpeace’s response came in three phases. First came a media response, focused on issues of climate justice. Timing helped: as Ruby neared the country, global leaders were gathering for the COP20 climate talks in Lima, Peru. 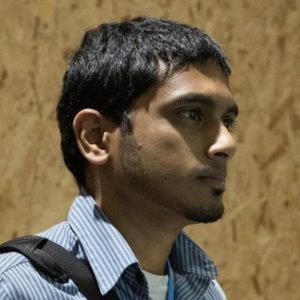 A decision by the local office to invite Kumi Naidoo (then International Executive Director of Greenpeace International) to visit affected regions, instead of going to Peru shortly after the storm hit, sent a powerful message to regular Filipinos about the importance of climate justice. Second, the response team on the ground identified a need for electricity. Staff quickly organised distribution of solar kits to be used by aid workers and first-responders. The third wave of response was a seed exchange organized by the Food & Agriculture team. The effort connected to Greenpeace’s work promoting ecological farming as an alternative to the seed monocultures promoted by Monsanto and other large corporations. This was not planned in advance. The idea came not from the top-down, but from the bottom up, and it directly connected the response with the work of the Food & Agriculture team in a powerful way. The seed program provided a meaningful response to both victims and farmers who wanted to help. It also brought ample, almost universally positive media coverage. The seed exchange continued long after the initial disaster response phase ended because of the connection between seeds and long-term resilience. The synergy of the response meant it flowed almost seamlessly from the climate justice response, with Kumi Naidoo, to renewable energy, and then to the eco-agriculture seed exchange. This wasn’t planned explicitly, but was no accident as Greenpeace priorities were tied to disaster response. Letting on the ground reality guide priorities also reduced turf battles between teams working in tandem, not in competition. Don’t be something you’re not. 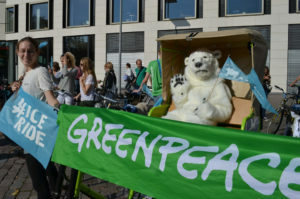 Greenpeace is not an aid organization, and local staff never tried to change the role of the organization to mimic the work of a relief organization. They found synergies connected to existing campaign work. Communication is essential. For nearly two weeks, Greenpeace operated a 24-hour crisis communications center. Keeping channels of communication between response teams on the ground, international staff, and allies was crucial in ensuring the response was as effective as could be. Use existing networks. The seed exchange did not require Greenpeace to build new connections with farmers – these were communities that the Food and Agriculture team worked with regularly. Moreover, having farmers provide seeds directly to other farmers allowed the organisation to avoid possible bureaucratic delays. Part of that was a willingness to give greater say to the response teams in the disaster-affected areas, allowing them to play an important role in deciding the response, with clear communication channels in place so that they could reach the entire organization. “Giving teams on the ground that space to maneuver and trust the information that is coming from the ground, proved to be very instructive in our decision making processes,” said Obusan. Also key was not trying to have everything run by Greenpeace, but letting others, such as farmers, lead. According to Obusan, this was a major cultural shift for staff, with huge positives. “This openness to involve others, and not just doing work that is to be run by GP people (allows) others to join your work, and creates a much more meaningful impact in the external world,” said Obusan. Greenpeace is not a relief organization, and the response was not meant to position the organization as a counterpart to those doing incredibly important aid work. But it recognized something else just as important; that the organization’s role in Phillipines society meant when a disaster hit, it affected Greenpeace as much as anyone else. According to Aaron Gray-Block with Greenpeace’s Response Lab, who worked with Greenpeace Philippines after Typhoon Haiyan, the change in thinking was substantial. 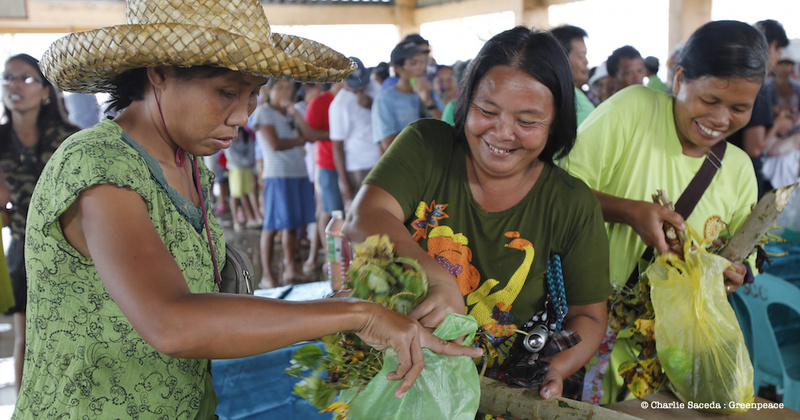 Top photo: Farmers exchange planting materials to choose only which they at a seeds distribution in Dolores, Eastern Samar, Philippines. A group of farmers from the islands of Cebu, Bohol and Negros – strong movers of sustainable and ecological agriculture – came together in the spirit of ‘Balaynihan’ to aid fellow farmers by collecting ecologically farmed rice seeds, root crops, vegetable seeds and organic fertilizers. Photo © Charlie Saceda / Greenpeace.